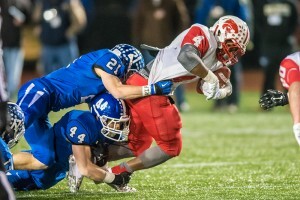 New Britain — Southington’s defensive swarmed another overmatched opponent on Saturday night. The Blue Knights held Norwich Free Academy under 100 yards and mauled the Wildcats, 49-0, to win the CIAC Class LL-Large title at Willow Brook Park. 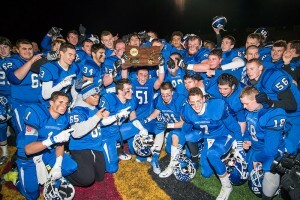 It was the second straight state title and third overall for top-seeded Southington (12-0), the top ranked team in both the New Haven Register media and The Day of New London coaches’ polls. 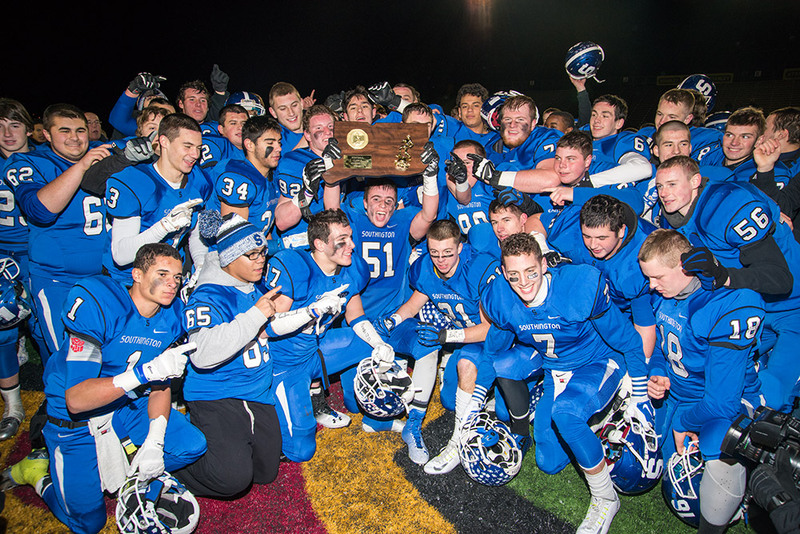 The Blue Knights outgained the second-seeded Wildcats, 495-98. Jamele had seven catches for 126 yards and two touchdowns to set the state career touchdown reception record. He passed Newtown’s Julian Dunn and finished with 50. “It feels good, but this victory is way better than that,” said Jamele said, who also scored on a 62-yard punt return. Jasen Rose completed 24 of 31 passes for 348 yards and five touchdowns for the Blue Knights and Matthew Maxwell had eight catches for 127 yards and three scores. Vance Upham ran 15 times for 104 yards and a touchdown for Southington. Defensive end Daniel Williams (14) and linebacker Matthew Thomson (10) were the Blue Knights’ leading tacklers. Khaleed Exum-Strong ran 19 times for 61 yards for the Wildcats (8-3). He had rushed for over 2,000 yards on the season. Southington led 14-0 with over three minutes left in the first half when Maxwell made a spectacular catch for a 49-yard touchdown. NFA was forced to punt on its next possession. The ball landed near Jamele, who thought for a second before picking it up and taking off. He took it for a 62-yard touchdown to push his team ahead, 27-0, with 1 minute, 28 seconds left in the half. RUSHING—NFA, Khaleed Exum-Strong 19-61, Jawaun Johnson 22-47, Daniel McDonald 2-13; Southington, Upham 15-104, Rose 4-31, Alessio Diana 4-21, Ryan Montalvo 1-3. PASSING—NFA, Johnson 1-8-1-8; Southington, Rose 24-31-348. RECEIVING—NFA, McDonald 1-8; Southington, Maxwell 8-127, Jamele 7-126, Kyle Borawski 4-50, Diana 2-20, Austin Morin 2-16, Upham 1-9.